Last month, MakerBot began offering its Smart Extruder+, a new and improved print head for its flagship Replicator and Replicator Mini desktop 3D printers. The company claims the new Smart Extruder+ provides a more reliable printing process for its fused filament fabrication (FFF) machines. In order to test this, MakerBot sent me a Replicator 3D printer and Smart Extruder+ to review. I've got to admit, I've been waiting a long time to review a MakerBot Replicator. First released in 2014, the current Replicator is MakerBot's fifth generation of its flagship product; it offers a large build volume (9.9 x 7.8 x 5.9 in.) and lots of bells and whistles. For example, you can start a print job using a mobile app and then monitor the progress of that job remotely via a camera on the 3D printer. The Replicator and the new Smart Extruder+ are well-designed products. The 3D printer has a smart look with its black plastic body and red-LED lit interior. The print bed is easily removed by sliding it forward, which is extremely handy for removing objects and covering it with masking tape (recommended for adhesion). The filament reel loads onto a rack that slides down and disappears into a rear compartment, which also saves space. The Replicator also comes with onboard memory for storing model files and you can connect your computer to the Replicator using either a USB cable or Wi-Fi. The Smart Extruder+ is sophisticated. It has a sensor system that communicates with the MakerBot Desktop application (available for OS X, Windows or Ubuntu Linux) and the MakerBot Mobile app (for iOS or Android) to keep users informed about the status of a print wherever they go. For example, the filament detection sensor notifies users -- on their computer or smartphone -- when filament is absent and automatically pauses a print to enable print recovery. The new and improved MakerBot Smart Extruder+ print head. It features an improved thermal management system and an extended Teflon tube to feed filament into the heated nozzle. The new extruder also provides faster print start-ups and more refined build plate leveling (the process of calibrating a 3D printer). Lastly, compared to its standard print head, MakerBot doubled its limited warranty for the Extruder+ to six months. MakerBot also offers some really handy services. For example, its Thingiverse app lets you open the file sharing service inside of the Desktop 3D printer software -- very handy for uploading files to your printer. And last year, MakerBot introduced the PrintShop app, which allows users to take photos of paper drawings with a mobile device, such as an iPad, and upload the image to their desktop printer to recreate it as a physical object. I had high hopes that the Replicator and its new extruder were going to impress me on the most critical attribute of all: print quality. For all its sophistication, however, both printer and extruder fell short of my expectations, particularly considering the price: The Replicator lists for $2,899 (see it on Amazon), while the Extruder+ print head goes for $199 ($99 if you purchase it with the 3D printer). I found the printer to be relatively slow, both in uploading designs from my computer and printing them out. For example, in a previous review, when I tried printing a 5-in.-tall Eiffel Tower with the Lulzbot Mini (retail price: $1,350), that machine took one hour, 44 minutes to finish the project. The MakerBot Replicator took two hours, 25 minutes to complete the task. In short, I found the Replicator 3D printer to be a relatively noisy machine (my co-workers complained for the first time since I started reviewing 3D printers) that produced average-quality printed objects and struggled to replicate small or intricate objects and designs. It also suffered from filament jams. Setting up the MakerBot Replicator was a snap. I had it up and running in about 10 minutes. After removing packing material and loading the PLA filament spool onto a retractable hanger, you simply follow instructions on a startup menu on the MakerBot's 2.25-x-2.75-in. LED screen. It walks you though leveling the build plate using the knobs under the display. The firmware literally takes you step by step through the process and automatically checks the distance from the nozzle to the build plate after each adjustment until it's correct. The Replicator's LED screen and physical selector knob make traversing options extremely simple: You turn the knob to curse through the menu and press the knob to select an option. And then, when I swapped out the Replicator's original extruder with the Smart Extruder+, I was impressed with how easy the new extruder snapped into place (due to a magnetic coupling that quickly attaches a 16-pin adapter plug). When my first print job was uploaded to the printer, the extruder automatically positioned itself to the print bed, leveling it, and away it went -- printing out a working nut and bolt. The MakerBot Replicator with Smart Extruder+ print head was able to produce a working nut and bolt straight out of the box after a 10-minute setup. However, while I honestly wanted to see some difference between MakerBot's original extruder and the new Smart Extruder+, I couldn't find a single thing. I printed three sets of models with each extruder: the Eiffel Tower, a paperclip in the form of a shark, and a nut and bolt. The time it took to print and the quality of the objects were identical with the original extruder and the Smart Extruder+. On the right, a shark paperclip printed with the Smart Extruder+ print head. On the left, one printed with the standard extruder. I could not tell the difference, and both took 33 minutes to print. As readers of my previous reviews know, my go-to test for 3D printers is a 5-in.-tall model of the Eiffel Tower. Admittedly, the tower is not an easy build; it has lots of tiny scaffolding and near thread-like pedestrian handrails on a catwalk. 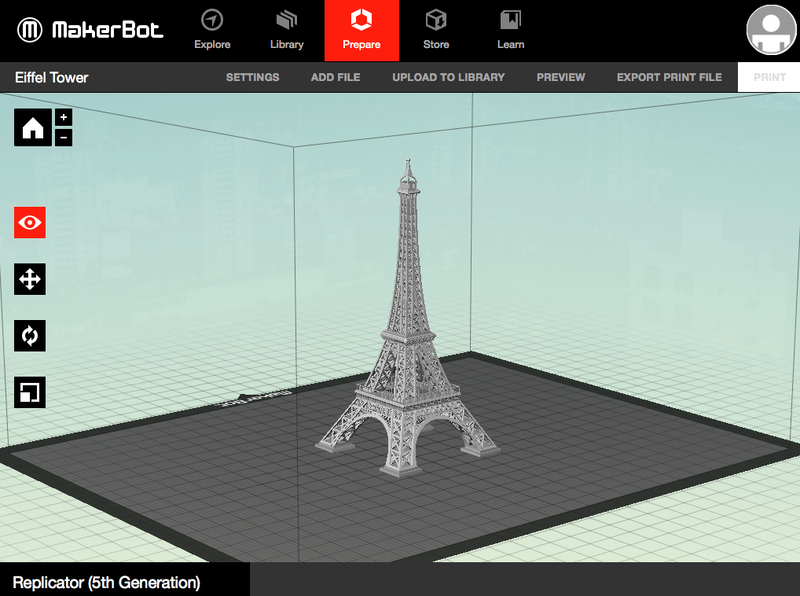 The Eiffel Tower, however, is a test that other 3D printers have passed -- even inexpensive ones. However, as it turns out, the MakerBot Replicator with its new Smart Extruder+ print head didn't. After three failed attempts to accurately print the 5-in.-tall Eiffel Tower with either extruder -- each time using different layer thicknesses ranging from .05mm to .20mm -- MakerBot suggested a larger Eiffel Tower model. The company sent me a link to a file on Thingiverse, MakerBot's wildly popular website for sharing user-created digital design files. When I reduced the print layers to .05mm in size, the Replicator simply failed to complete the task of building the Eiffel Tower. They weren't kidding when they said bigger: The tower came in nine pieces and was just over 24-in. high. It would take three to five days to print (depending if I ran the machine day and night) compared to the 5-in. model that took the Replicator two hours, twenty-two minutes to print. This 5-in tall Eiffel Tower was about as good as the Replicator could produce. The tower's intricate scaffolding was just too much for the 3D printer to replicate. The tower's spire turned from a four-sided structure to a cylindrical shape. Undaunted, I pressed ahead -- but I encountered a significant problem: The base of the larger model pieces had a tendency to curl up because they didn't adhere to the print bed, which is unheated. In one case, the footing of an entire section of the tower detached from the bed 21 hours into the print job, leaving the remainder of it in a tangled mess of spaghetti filament. That was quite annoying. One solution I attempted was to slather the tape covered print bed with a glue stick. Glue sticks are often recommended by makers of 3D printers without heated print beds. And, in fact, the glue stick helped to adhere printed objects on the MakerBot Replicator. However, I still experienced some minor warping. Even with masking tape, the print bed had issues with adhesion. Here the base of the Eiffel Tower's edges are curled up on its edges, making it unusable as a part in the model. Unfortunately, the edges didn't begin to curl up until I'd left the office for the night, so 12 hours into the print, it had to be cancelled. I feel MakerBot needs to address this deficiency. Instead of recommending (as it does now) that users put masking tape on the print bed for better model adhesion, it needs to introduce a heated bed as some other 3D printers have or at least supply glue sticks with their machine. Additionally, the Smart Extruder+ continued to experience filament jams, requiring me to restart jobs that had been printing for an hour or more. Finally, I just gave up and reinstalled the standard extruder that had come with the printer. That worked, allowing me to finish the final base piece of the Eiffel Tower model. Through the combination of the Smart Extruder+ and the standard extruder, the Replicator produced an impressive two-foot-tall Eiffel Tower. Sadly, I was unable to print it using a single color as the failed print jobs used up all the orange filament I'd been using. The completed two-foot-tall Eiffel Tower. One of the attributes MakerBot highlights on its new Extruder+ print head is increased reliability, something that can save a user time and avoid wasted filament on failed builds. 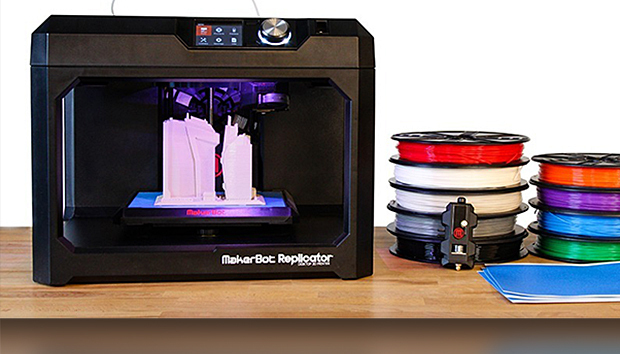 In 2013, MakerBot was purchased by industrial 3D printer maker giant Stratasys. Stratasys aided in designing and testing MakerBot's new extruder head, which involved more than 160,000 cumulative hours of print time. According to MakerBot, a total of 5,800 prints were completed by two groups -- one at MakerBot and one at Stratasys -- to help ensure independent verification of the results. MakerBot's Desktop CAD/management software was sufficient, but lacked features such as being able to inspect each layer of a model. "The testing shows that the Smart Extruder+ consistently and reliably prints for over 700 hours on a MakerBot Replicator Desktop 3D Printer, which equals 1.44 miles of MakerBot PLA Filament. The vast majority of test units were still printing successfully at 1,200+ hours of print time," MakerBot states in its marketing material. I'm not familiar enough with the standard MakerBot Replicator extruder to judge, but I experienced several feed jams with the new extruder, which was quite frustrating. A feed jam means that the print job -- already uploaded but not yet started -- must be cancelled while you unload and reload the filament. Feed jams or extruder clogs can also stop a build in mid-stream. I had that issue with one of several Eiffel Tower builds, and I wasn't able to get the printer to resume the job properly once the jam was cleared. Clogging can usually be fixed with something as simple as a brass wire brush to scrub the extruder tip every so often -- something that MakerBot could include. MakerBot's customer base is primarily made up of educators in schools seeking to teach students material fabrication and secondarily professionals looking to prototype parts; the consumer market is nowhere near either of those, and that may be for good reason. While the MakerBot Replicator with Smart Extruder+ print head may be durable and able to create larger objects with relatively good intricacy, it falls short on details, particularly with smaller objects. It also has some big problems in terms of objects not adhering to the print bed. I'd also like to see MakerBot work on the mechanics of this open-air machine to create smoother and quieter operation. Overall, I can't recommend the MakerBot Replicator -- mostly because of its cost. At nearly $3,000, there are better machines out there. However, with a few tweaks, I think this 3D printer could become a real winner.